During the first minute of his speech on the 25th of September 2018 to the United Nations General Assembly, president Donald J. Trump received a greeting of muted laughter. For the near hour of the speech that followed, you could have heard a pin drop in the cavern. Trump minced no words. He was brutally clear to everyone in the General Assembly that the United States of America meant business. The repercussions of that speech will be world changing. Foremost In the president's message to the world was his rejection of globalism represented most by the governing apparatus of the United Nations and its supporting agencies. The UN had been born in an era of global power concentration at the end of World War II. It has functioned as such since then concentrating the real power over the planet in the Security Council. This model husbanded the planet through the Cold War and a period of post-Colonialism in the aftermath of it. But much like his domestic presidency is a recognition that established bureaucracies can become bloated by elitism and hubris, so can the world stage. I found it poetic that this message to the world that the time has come to set central control aside and embrace a more plural form the world governance was delivered in the General Assembly where decades of evolution adding nations represented in the room have brought necessity to evaluate the issue of how nations relate to each other to the forefront. This has been evolving for some time. The world has become more regionalized with confederations, some cooperative and some adversarial, emerging on the planet. The European Union has gone through several cycles of growing pains, so has Russia and its Confederation of Independent States. These two regions of the world have now existed in their present forms for longer since the fall of the Berlin Wall now longer than the entire length of time the Cold War wall existed. The Middle East and Africa have undergone radical change from a landscape of colonies to amalgams of nations. The world became plural in an image, quite honestly, modeled after the original hopes of the United Nations and financed, in many cases, by the treasure of the United States. Mission accomplished. Hooray for us monkeys! In his speech, Trump challenged this now more plural world to begin to live up to its potential. In doing so, he announced that it was time to win the world of American dependence. He pointed out that for America to navigate into its own future such a change was a necessity. He implied that this necessity applied to every other nation as well. The stunned silence in the room was surely no surprise to the American delegation delivering this 21st century tough love message. I smiled to myself as I listened to it not because I am an isolationist, but because I am an American. I’m pragmatic about the practice of global stability and national policy. I found my thoughts drifting back to a much younger United States of America. In the 1790’s and leading up to the War of 1812, the United States was a beacon of freedom to a Western Hemisphere dominated by colonial masters. They coveted how the United States was thriving in its social and power experiment. Throughout the Americas, people saw the emergence of a free and independent nation and wanted the same for themselves. America's leaders struggled with the requests for aid throw off the world powers of that era and cast them out of the New World. There was acrimony about it at the time, and regret. America's leaders knew we were not rich enough or powerful enough come to the aid of our neighbors and risk the combined might of Europe against us. Mind you the British did try. Lucky for us, we survived the War of 1812. More importantly for the world’s future, we chose to lead by example that would become a hallmark of our future conduct on the world stage. We took the position of tough love showing our neighbors what was possible, to inspire hope even if (no because) we were unable to do it for them. We recognized even then the wisdom of teaching others to fish. If you think about it openly, the world is in a similar position today following the abandonment of colonialism worldwide. There are only two nations rich enough to vie for hegemony on this planet. This would be the multi-trillion economies of the United States and China. No one else has this potential. Both nation’s societies are presently in flux. One is pursuing hyper-patriotic centralization of social values controlled via the technology of universal social scoring. The other tumultuously hangs on to its internal pluralism using technology in an endless series of trials by fire, well technically flame wars, to bring everyone’s egos to ground. Stepping back and looking objectively, both nations are experiments in the future of complex societies for this planet. Opposite in approach, these two nations are the templates for where technological humanity must find a future. Clearly neither model has found its sweet spot yet. Is what it is. What will be interesting in the next decade is whether the US and China come to blows over these templates or find a way to manage their polar forms of leadership in concert for the benefit of the remainder of the world. Perhaps we’ll find a new détente. 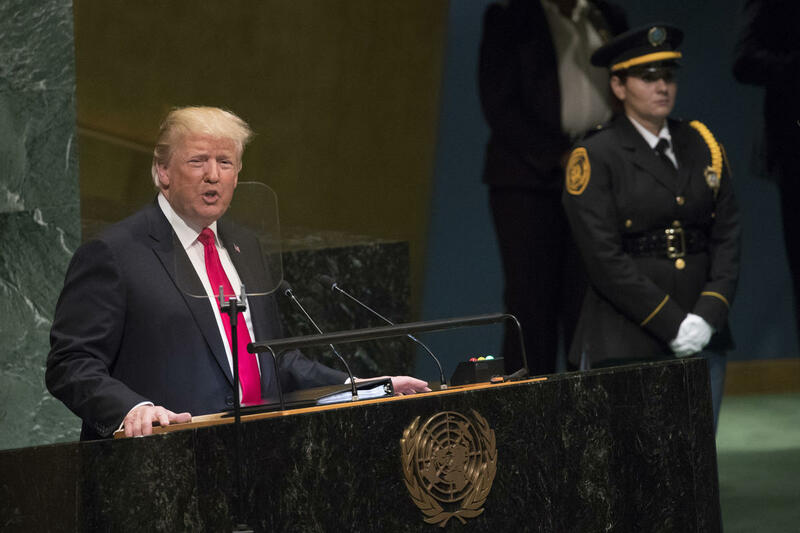 Hopefully, the UN General Assembly noted in its silence of President Trumps speech, the bilaterally messages between the Unites States and the nations single out by the US, that included carrots and sticks, loud and clear. I believe that the American delegation’s message to the United Nations in 2018 will go down in history as a reminder by the United States of the same message it has stood for since its birth. For whatever acrimony the news of the day makes of this inconvenient truth, President Trump did his job as our messenger effectively.